For Grant Kent, Delta Force vet, just being near Isabelle brings back old memories and desires, and stirs longings he'd rather deny. Yet he can't ignore the real terror in her eyes, or resist the thought of holding her again. But even as their friendship begins to blossom into a passionate affair, a killer continues his deadly rampage and plots his next move: the "suicide" of Isabelle Carson. Shannon K. Butcher once spent a summer chasing tornados with the National Severe Storms Lab in Oklahoma on an undergraduate research project. A former engineer, she now writes full time. She lives with her husband and their son. 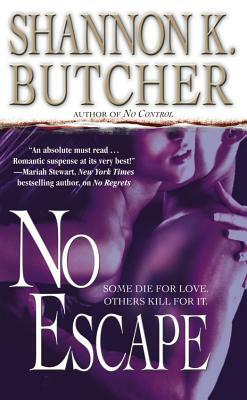 NO ESCAPE is her third novel.